Thai truck drivers carry negative perceptions and are stigmatized as ‘thugs’, being judged on the aggressive and meaningless artworks of their trucks. This leads to poor self-esteem and performance on the road. 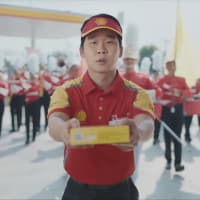 Shell Rimula, heavy-duty engine oils for trucks, wanted to change the public’s perceptions and give truckers a renewed sense of pride, supporting them to perform their best in every journey. To change perceptions and give truckers pride, we came up with ‘The Art of Hero Truckers’ – a campaign that create meaningful truck designs telling real drivers stories - so they can carry it with pride in every road. We turned the trucks' exterior into a moving display to change perceptions and build understanding on the road – where the tension stems from –, giving truck drivers a renewed sense of pride, boosting their self-esteem and improving their performance when they need it the most.